Best Management Practices For Beekeepers (Home) - Project Apis m.
The pollination service honey bees provide is essential for a healthy food system. The stability of the agricultural industry is threatened when these crucial pollinators are not performing. Everyone must work together to manage honey bees in a way that protects them from pests, pathogens, and environmental factors. Beekeepers, bee brokers, growers, farm managers, pest control advisors, applicators, regulators at all levels, and researchers all need to follow the same guidelines to ensure honey bees can deliver a diverse diet to our plates. Best Management Practices (BMPs) have been developed by different stakeholders and organizations interested in protecting and utilizing the honey bee in the most efficient way possible. ​A Best Management Practice is a practice, or suite of practices, determined to be the most effective and practical means to achieve a desired objective. Beekeepers and growers alike share the same objective--to enhance the health and vitality of honey bee colonies while improving crop production. BMPs serve to guide all interested parties to this objective. 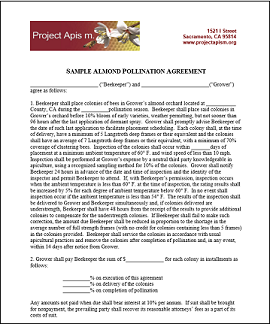 Project Apis m. has worked with the Almond Board of California and the Honey Bee Health Coalition to create BMPs for managing Varroa and Nosema, and assisting almond pollination. BMPs can be adopted by everyone in the chain of communications with shared goals, so please share and download them freely. While considered the “best” by experts, BMPs are voluntary practices and not legally binding. ​"Best Management Practices for Bee Health"